In a two-part episode of PBSKids Arthur, Binky’s family will adopt a baby girl from China. Binky receives this news with anticipation, and delights in helping prepare for her arrival and visiting China. Growing through his worries about life changes and, more importantly, whether his new sister will even like him—Binky becomes the proudest big brother in Elwood City. The Arthur pre-production and writing teams conducted extensive research and interviews with adoptive families to create the special episodes. “We hope the millions of families touched by adoption in this country, and around the world, will find familiarity and accuracy in our portrayal of the experience of these characters,” says Executive Producer Pierre Valette. “Big Brother Binky” will premiere Friday, September 7; visit www.pbskidsgo.org/arthur for local listings and encore presentations. Further resource: Adoptive Families.com describes “Big Brother Binky” in detail and gives background on Arthur's previous connection with adoption. Thanks to Children's Hope adoptive mother, Dana Dang, for passing along a great article on Vietnam travel published inTravel and Leisure Magazine in March 2007. As a world traveler who calls Hanoi, Vietnam her second home, fiction writer Dana Sachs brings the country to life for prospective parents through Vietnam adoption in her article "Vietnam Now". Whether you'd like to experience french fries Vietnam-style, or visit local islands and alternate cities, Vietnam can be a welcome surprise and a lasting memory for those that visit. Experience your trip like a local and learn about the following terms and locations you may experience in your Vietnamese travels while completing your family. longan: an evergreen tree of southeastern Asia and Australia grown primarily for its sweet edible fruit, similar to litchi nuts; quả nhãn in Vietnamese. The longan, aka dragon eyes, is named for the shelled fruit's resemblance to an eye, as the black seed shows through the translucent flesh much like an iris. Find amazing photos of these locations at ThingsAsian online at http://www.thingsasian.com/vietnam. Learn more about Dana Saches and her Vietnam fiction at her web site, VietnamUniverse. Add a little flair to your personal website, or support Children's Hope on myspace, by adding a Children's Hope banner to your personal site! Copy your favorite banner code below and paste it into your blog sidebar template or myspace profile editor to help spread awareness and the mission of "Homes, Health, and Hope for Children in Need". After an extended trip to the US, Children's Hope Associate Director Melody Zhang returned to China just in time to catch five Children's Hope teenagers in their last day of the CCAA China culture camp, named "Embracing China & Experiencing Beijing Summer Camp 2007". Caption: (left to right) Sarah Health and Joy Barker (daughter of Brenda Barker, Director of Children's Hope Southeast Branch) departing for the first ever, CCAA sponsored culture camp in Beijing. Isabelle Vishnesky is a runner, a jumper and quite a little climber. She LOVES the water, and will no doubt be taking swimming lessons next summer if her surgery schedule permits. She’s also quite the girly-girl and was just thrilled when her hair finally got long enough for some pig tails! Isabelle Vishnesky is just beautiful! 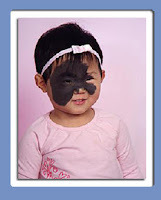 Adopted from China in November 2006, Isabelle's family is planning for her best and hopes to help their daughter achieve a more conventional appearance. 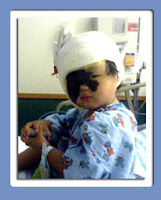 She had her first surgery on August 13 to insert skin expanders in preparation for removing a large portion of her nevus on November 5. She took it like a trooper and was up and ready to take on the world the very next day! Of course, her parents know that’s not the best idea, so she’s a little upset with them because they keep reminding her, “No running, no jumping, no climbing! You need to relax!” Not a three-year-old’s favorite things to hear! The skin expansion process is underway for her November surgery. We hope her beautiful smile inspires all who see her. This is a prayer request for a successful surgery and smooth healing; this little girl has come a long way but she still has far to go. Please include Isabelle and her family in your daily prayers. To learn more about giant nevi, visit WebMD's online. For the fifth year in a row, Children’s Hope International in Vietnam was honored by the Ho Chi Minh City People's Committee for instrumental development work as an international non-governmental organization (INGO). The merit certificates were presented by the city's Union of Friendship Organizations on August 9 to seven development aid representatives of INGOs and one individual, highlighting research on HIV prevention and awareness. “It is a very high honor that few adoption agencies receive,” says Children’s Hope International’s representative in country, Thuy Nguyen. Le Hung Quoc, chairman of the Union, thanked the organizations for their contribution to the city’s social development. Quoc says the city's foreign non-governmental aid has reached more than 7.7 million over the first half of the year, marking a 12 percent increase compared to the same time last year. Children’s Hope development aid to Vietnam has doubled during this same time period. 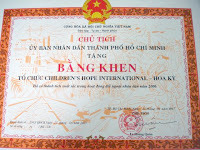 Children’s Hope has been a supporter of the HIV Center within Ho Chi Minh City since 2002. The center now cares for 80 children, all HIV positive at birth. When first built, Children’s Hope purchased new beds for all infant and toddler rooms and has continuously supported the orphanage with funding for HIV medication and holiday celebrations. Thirty-five children have been sponsored in Vietnam through Children’s Hope first year of orphan sponsorship. The US Citizenship and Immigration Services (USCIS) announced money saving changes for families experiencing delays in their adoptions. Children’s Hope Southeast Branch Director, Brenda Barker, was invited by the USCIS to a meeting in Memphis, Tennessee on Monday, for the announcement of new implementations which will make I-600A (along with the fingerprints) and I-824 extensions free to adoptive families. Dr. Emilio Gonzales, Director of USCIS, said he personally reads all correspondence addressed to him from the adoptive community in regards to fees, of which these changes are a direct result. Please find excerpts below from the official USCIS press release. * USCIS now permits prospective adoptive parents to receive one no-charge extension of the approved Application for Advance Processing of Orphan Petition (Form I-600A) if they have not already submitted a petition (Form I-600) to classify an orphan as an immediate relative. This extension is valid regardless of the number of children the prospective parents are authorized to adopt. Prospective adoptive parents must make the request in writing and USCIS must receive the request no earlier than 90 days before the expiration of the Form I-600A approval, but before the approval expires. In addition, requests must include an updated or amended home study. USCIS does not charge a fee for the home study, however, the home study provider may charge for preparing an update. * Prospective adoptive parents who have an approved Application for Advance Processing of Orphan Petition (Form I-600A) on file with USCIS may now request a one-time, re-fingerprinting without charge. Since the original fingerprints are valid for 15 months, and the approved Form I-600A is valid for 18 months, the free re-fingerprinting is valid for an additional 15 months and will cover the three-month gap, aligning with the timeframe of an extension of the I-600A. * Prospective adoptive parent(s) may also make one request for a change of country notification without charge. The written request must include all supporting evidence to substantiate the change of country request. Prospective adoptive parent(s) should not use the Application for Action on an Approved Application or Petition, (Form I-824) to request this one free change of country request. For a second or subsequent change of country request, however, prospective adoptive parents must file the Form I-824, with the appropriate fee. I have longed to send this update but the computer has not been working in my favor over the course of my time here in Ethiopia, as power is lost frequently. Nevertheless, I wanted to persevere to send this update to let you know what the Lord is doing in Ethiopia. We currently have sixteen staff working at Children's Hope/Ethiopia. All of them have felt led by the Lord to enter into this work with Children's Hope, House of Hope. They are some of the most gracious, hardworking, dedicated people that I've ever met. We currently have four nannies (in title), however, it's amazing to see that everyone takes part in taking care of the children with Jesus' joy…from the guards to the cleaners. It's amazing to see. So now when I'm asked how many nannies we have I will say sixteen (with an explanation, of course!). We have ten children now at the House of Hope. One arrived just a couple of days ago and two arrived today (Monday). Four of those children will be traveling home to their American families over the next three weeks. The first will arrive in St. Louis on August 11. All of the children are absolutely adorable and loved very much by our staff. Today, I visited one of the orphanages from which we have been receiving referrals. I was so impressed with this orphanage. The director of the orphanage was so welcoming and inviting. Nothing was off limits in visiting her or the orphanage. The orphanage was bright and colorful and clean and has been established for only three years. Children's Hope is the only US agency that this orphanage places children with. The director spoke very highly our agency and the integrity of our Ethiopia representative (Tsegay). She is a Christian and I could see and hear the passion in her face and voice as she talked about her work and the children. She places children 1-day-old to 7-years-old. She has several babies who were abandoned in the streets at birth, (still with the afterbirth attached) and the police often call her when they find newborns abandoned on the streets. She cares for twenty children at a time. I will be visiting other orphanages in the coming days. What I've witnessed and experienced here in Ethiopia will change me forever. I know that I will leave this country having received far more than I can ever give. Nevertheless, I am humbled to be doing this work for the Lord. Families, stay busy with completing your home studies and dossiers, we're going to have several children to place while the courts are closed. However, once the courts reopen, more than likely it's going to take a little bit for the courts to catch up. As mentioned earlier, there are adoption cases now that will be waiting to be heard when the courts reopen; as well many agencies will be receiving dossiers and offering referrals, as we will while the courts are closed. So it may be a little slow starting back up, but God is moving. Our development aid representative from our St. Louis office will be travel to Ethiopia this week to join me and our Ethiopia representative to work to set up our child sponsorship program. There is such a tremendous need here in Ethiopia and we are overjoyed to be moving into the area of child sponsorship in Ethiopia. This is a few months down the road but we are getting the preliminaries in place. Today, our third and final family (before the courts close) had their adoption finalized in Ethiopian court. What a joyous occasion! I know that the courts were to be closed already, but there were so many adoptions the court was trying to finish that they left Monday open as a work day in the event that it was needed. And thankfully for our third family, their adoption was finalized today. A huge congratulations to this family! Hear more of Sharon's update tomorrow on the blog, from Ethiopia! Looking for more resources on what to expect from international adoption or guidance now that you are home as a united forever family? The Voices of Adoption community and editor Martha Osborne of Rainbowkids.com have created a new resource for families of adoption. Find adoption-related articles by and for adoptees, adoptive parents, adoption professionals, birth-parents and experts in the fields of medicine, social work and advocacy, as well as all others who have been touched by adoption. Visit online at http://voicesofadoption.rainbowkids.com to further grow and learn as an international adoption community. 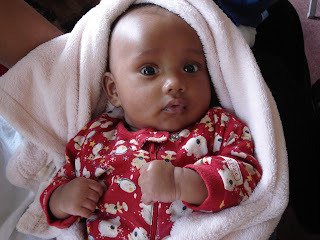 An Ethiopia Adoption Finalized: Children's Hope Second Pioneer Family Set to Travel! With the Ethiopian courts officially on break now until October 1 for the Ethiopia rainy season, we are even more excited to announce our second pioneer family's adoption finalization! Jenni and James of Illinois became the official parents of 3-month-old Mamush (literally "little boy, my baby") on August 2. A big congratulations to this Children's Hope family! The family will travel to Ethiopia to meet their son at the Children’s Hope transition home House of Hope in mid-August. "He will always be our 'Mamush'," says Jenni. "We're gonna be on our way to see our son's beautiful face for the first time. This is really happening!" Caption: (above) Jenni and James experience pure emotion when they see their child's first picture on their referral day, July 16. (below) Meet Mamush. St. Louis--When their social worker Christina Ortwein showed Charles and Julia Holmes photos of their new daughter, they could hardly catch their breath...neither could their daughter Avery. Expectant of this special referral day, Avery wore her panda pen, emblazoned with the words "big sister" in Chinese. The family joins 21 additional Children's Hope families celebrating this referral day, after waiting 21 months from the day China entered their adoption paperwork in November 2005. Children's Hope received 22 China referrals today, including four referrals for our Chinese expedited families. Twenty-one beautiful little girls and one very handsome little boy made up the group matched with Children's Hope families today. These children are now waiting to meet with their new families in the Anhui, Guangdong and Hunan provinces, in approximately 8 weeks. They range in age from 7.5 to 20 months, one 26 month old (parents requested 1 - 3 years of age), one 27 month old (parents requested 12 to 24 months old) and one 37 month old (parents requested 7 to 36 months old). These families had waited 21 months since their paperwork was registered in China to this day; the Chinese expedited families waited 14 months. This group of referrals covered the 11/15/05 through 11/21/05 "log in dates". Congratulations to these families and all our China families who are that much closer to their own referral day! In a notice today from the US Consulate in Guangzhou, Children's Hope was informed families will continue to be issued "IR-3 immigrant visas for children adopted in China regardless of whether one or both parents appear for the swearing in ceremony." This statement reverses their decision given on July 31 to all agencies. One parent has the option to depart from China after seeing their child and finalizing their adoption, and still have their child receive an IR-3 Visa as long as one parent is present for the Visa process. This situation has served to highlight the range of travel related health issues families need to consider associated with all international adoptions. Anyone traveling to pick up the child should visit a health-care provider or travel medicine specialist as soon as travel is considered to ensure that all routine vaccinations are up to date and to obtain pre-travel advice tailored to their own medical history. Health consultations should also be considered for any additional family members not traveling as well as caretakers to ensure that they too are up to date on relevant immunizations. Contains a wealth of information on health issues pertaining to international travel including information on destination countries, recommendations regarding immunizations, and Travel Notices such as the one recently posted regarding hepatitis associated with adoptions from Ethiopia. A compilation of CDC recommendations and general information tailored to travelers. It includes sections that specifically discuss international adoption as well as traveling with children.